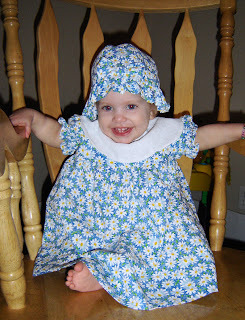 Thanks to Grandma Butterfield who made this adorable Dress,Bloomers and Hat for Madi's Easter dress. We love it, even though Madi is screaming in the last picture. Darn it, I wouldn't let her stand up and rock in the rocking chair! 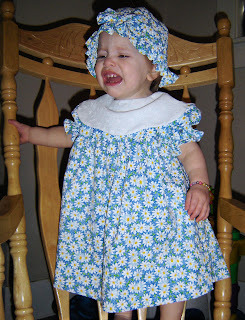 Those are some super cute pictures, love the easter outfit its cute! I actually got your blog address from Dayna so here is mine so you can check in on us if you ever want. Cole really does look like you! 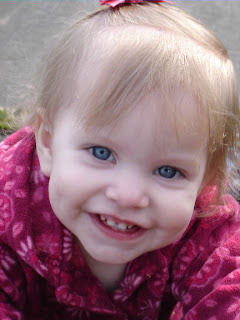 And that last photo of Madi is just the cutest! She has such a contagious smile!